Walking through downtown Atlanta, a surprising gem of a green space is Hardy Ivy Park. One of her jewels is "The River Sings," a painted metal sculpture by Richard Taylor, a rather successful artist who lives in Wisconsin. The park serves as a memorial to Hardy Ivy who was Atlanta's first permanent settler. 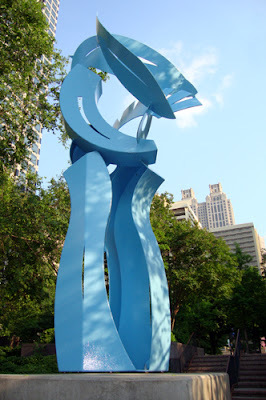 Shared with Taylor's 15.5-foot, 2009 sculpture, the Carnegie Education Pavilion also resides in this precious plot of downtown real estate where Peachtree departs its short-lived straight line to begin an adventure on a course winding through the City and beyond. Adding to the coolness of Taylor's creation, the artist says of his own work, "My work allows the cadences, rhythms and syncopations of music and poetry to find themselves in visual expressions in paint, metal and space." The River Sings was provided by the City of Atlanta's Office of Cultural Affairs' Public Art Program. A couple a beautiful things are in Ivy Park that punctuates the north end of downtown. They do catch the eye even among the towers.